‘Hollywood Medium With Tyler Henry’ is an American reality show that airs on E!. The series premiered for the first time on January 24, 2016. It basically centers around Henry meeting with celebrities and sharing messages with them that he claims are from their departed, loved ones. Clairvoyance has always been a hotly debated topic in the modern west, and much of its appeal was due to this controversy regarding its validity itself. The earliest TV media to feature psychics capitalized on its occultism and the natural intrigue that derives from occultism. It was not before James Roday’s hit TV drama ‘Psych’, with its massively successful 8-season run throughout a decade, that psychics became a thing in mainstream TV. Even so, we do not see as many shows centering around professional clairvoyants as we see more general shows about paranormal occurrences. This, in part, is what makes Tyler Henry’s ‘Hollywood Medium’ such a successful show. It does not have any gimmicky, over-the-top elements to scoop in more press, but instead, it remains an example of authentic documentation of a professional psychic’s work, captured organically like any other usual celebrity interviews are broadcasted. Hollywood Medium With Tyler Henry Cast: Who is in it? 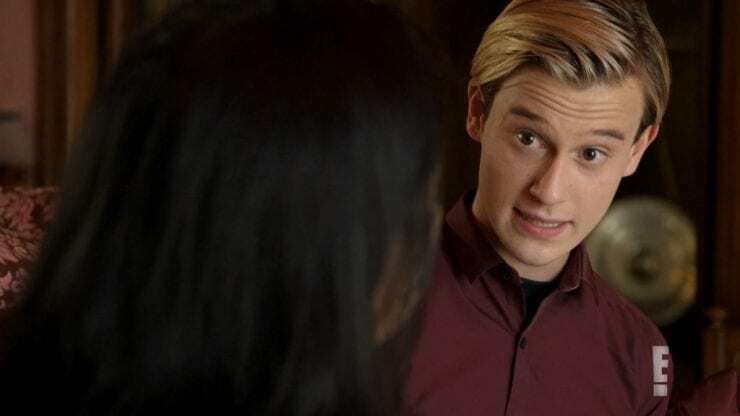 As the title card itself clarifies, Tyler Henry is front and center for the show’s runtime and even the premise of ‘Hollywood Medium With Tyler Henry’. Tyler is a successful professional psychic. Although his age does not reflect it, his experience and expertise have gone hand in hand to make him one of America’s most sought-after clairvoyants. It is no exaggeration when Tyler Henry is advertised as ‘Hollywood’s most famous Medium’, which the idea of the show springs from. Over the seasons, Tyler has had various celebrities on his show, including the Kardashians, Nancy Grace, Megan Fox, Alan Thicke, Carmen Electra, and Matt Lauer among others. However, following Thicke’s death, and the sensational headlines about how Tyler had predicted the coronary condition that would lead to his demise, painted the show with a brush of controversy. Nonetheless, no news is bad news, and the popularity of the series seems to have increased after the controversy, which was debunked since heart disease is the leading cause of death among American males. Anyhow, in the upcoming season, Henry is definitely going to return, since there would be no-show without him, and we hope to see even more celebrities whose star power remains an equal attraction for viewers, as much as Henry’s own skills as a medium, intrigue and draws people to the show. Hollywood Medium With Tyler Henry Plot: What is it about? The plot of ‘Hollywood Medium With Tyler Henry’ basically follows Tyler as he meets and lets celebrities know about the messages that they are supposedly receiving from the other side, vis-a-vis, from their loved ones who have passed away. To start off, let me make it clear that there has been a lot of scientific proof coming from people better equipped and trained than I am, to disprove Henry. He has his camp of skeptics, and followers, as is the case with anyone who claims to do what falls outside the natural realm of reality. However, what stands out about Henry’s show is how he manages to make it look all so effortless. Even if it is intelligent guessing and careful studying of a celebrity rather than actual supernatural communication, Henry puts up a great show, and this is what draws us to it. Of course, this raises the more important, and in my opinion, the more fascinating question about the relationship between the human mind and the unknown. It is believed that anxiety or fear is inversely proportional to our proximity to the unknown. However, in the case of this show, we are not really exposed to the unknown. Even if there is something supernatural, we get it through a medium, that is Tyler. Therefore, we have all the fascination of the unknown and none of the fear. This is what helps shows like these, stand out. The additional factor that is brought into the show is communication with loved ones. Death has a degree of finality which shapes our entire lives. However, Henry brings us the possibility that the finality may not be so final after all. The possibility of existence after death pleases us as much since we have the chance to talk to our loved ones, but it stems from a deeper satisfaction and relief at the fact that we too will continue to exist in some form after our death. Make no mistake, when Henry performs his clairvoyance, this is all that he is offering. Not to mention that he does it to celebrities, which as I firmly believe attracts us more, since the celebrity culture has turned these people into spectacles who we like to observe at all points of their lives, and even more so at their most personal moments. These moments shared with Henry counts among them since it taps into the celebrity’s life and the death drive. Surely, there must be some sort of correlation between celebrity narcissism and the death drive as well, but that is too technical a topic and does not tie in with what Tyler is offering. Tyler offers a way to calm your own mind and enjoy the possibility of the supernatural. He offers amazement, and the celebrities and viewers are all buying it. Hopefully, in the upcoming season, Tyler will carry on his show in a similar manner as he continues to tap into his psychic powers to read the futures of celebrities and communicate with dead people, leading us to believe that there is more to life than the inevitable finality of death. Hollywood Medium With Tyler Henry Season 4 Release Date: When will it premiere? ‘Hollywood Medium With Tyler Henry’ Season 3 premiered on February 28, 2018. In August 2018, it was announced that the show had been greenlit for a new season. Season 4 is slated to release on April 25, 2019, and the first episode will have Rebel Wilson, Sofia Vergara, and Chris Harrison as the celebrities on the show. Here’s a sneak peek of ‘Hollywood Medium With Tyler Henry’ Season 4. Check it out see if you are interested.